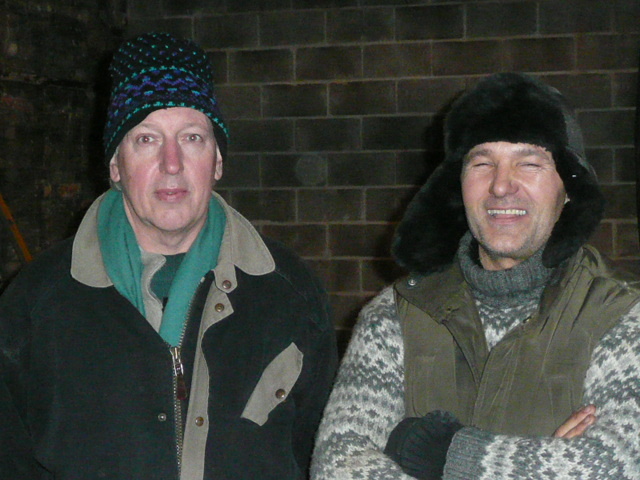 Gerhard (Architect), and Ted (General Contractor) at a recent site meeting brace for the cold. 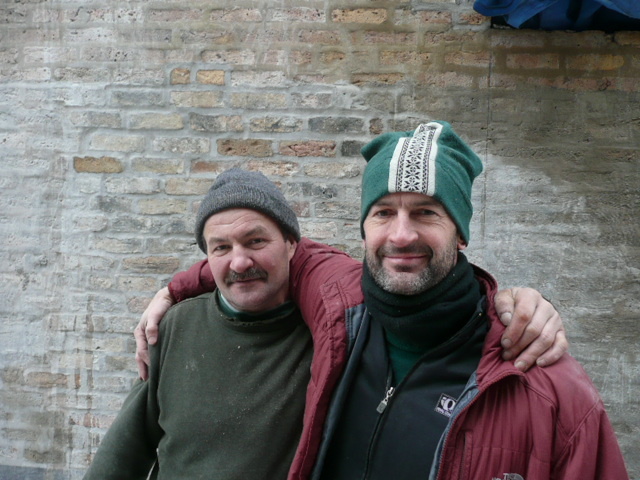 Gerard (left) is really not always so serious! Part of the great fun of this project has been working with the team involved in bringing everything together. Everyone learns from everyone else and we frequently debate and challenge each other on what sustainability really is! Woytek speaks virtually , strike that, Woytek speaks no english. Every day we have a conversation. I don’t know how it started but every day, with complete animation Woytek tells me his opinion of the furniture I’m making in the wood shop. I usually reply with thanks and ask him more about if he thinks its well-built. Then he expounds further and I consider his response. Then he leaves and I have no clue whether we were talking about the same thing. Somehow the other day though when he cut his hand, I was able to produce black electrical tape to wrap a wet bandage around his thumb, which apparently is EXACTLY what he was looking for. And so it goes. . . . This entry was posted on Tuesday, January 12th, 2010 at 2:02 pm and is filed under 1. You can follow any responses to this entry through the RSS 2.0 feed. You can leave a response, or trackback from your own site.